The countdown has started: The UEFA Champions League knockout phase begins on 12th February 2019. And this means that the product brand DT Spare Parts is once again looking for the “DT Spare Parts Champion 2019” with a new edition of the betting game. The participants can look forward to attractive prizes worth a total of 5 000 euros! 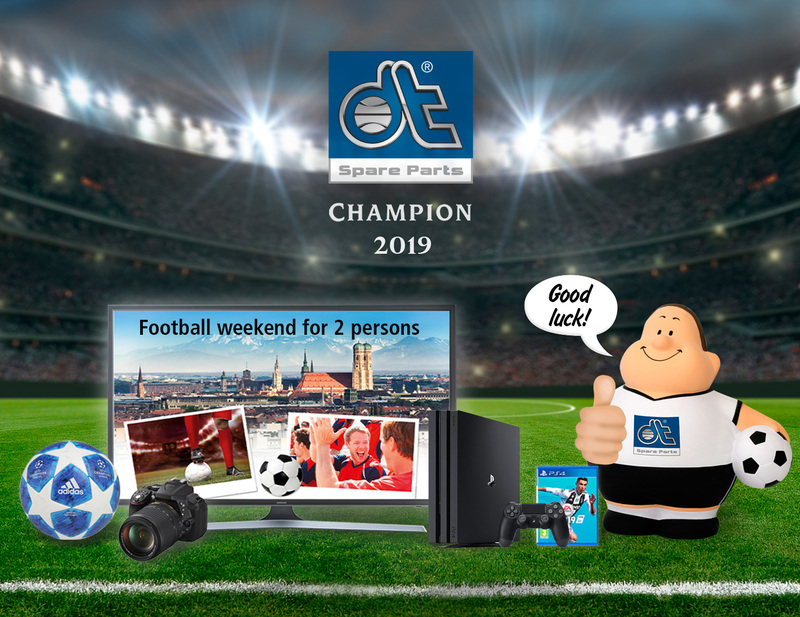 With the round of 16 in the knockout system, fans of the product brand DT Spare Parts have a great chance of winning attractive prizes – with a little luck and the right scoring instinct: The „DT Spare Parts Champion“, i.e. the best participant, will spend an unforgettable football weekend with an accompanying person of his choice, including flight, overnight stay in a hotel and two tickets for a football match. The second winner can look forward to a high-quality flat screen (OLED) that brings the stadium atmosphere directly into the own living room. The third best player wins a high-quality digital camera. DT Spare Parts has a game console with the FIFA 2019 game ready for fourth place. The official UEFA Champions League football from Adidas is available for participants who finish in places five to ten. All prizes are rewards in the DT Spare Parts Premium Shop. If you can't wait until the final for the main prize: All registered participants in the Premium Shop can win an official Champions League football after each match day (first and return match). So if you want to increase your chances of winning, register right away in the Premium Shop. The rules of the “DT Spare Parts Champion 2019” betting game are simple: football fans and those who want to become one register for free at champion.dt-spareparts.com and submit their bets before each match day in order to collect as many points as possible on the way to the final. The player with the highest number of points after the final on 1 June 2019 at Estadio Metropolitano, the new home stadium of Spanish first division team Atlético Madrid, will become "DT Spare Parts Champion 2019". If the points are equal, the winner will be drawn by lot and the legal process is excluded. If you want to have a high chance of winning the title "DT Spare Parts Champion 2019" as the best betting player, you should register now, because the results of all matches of the entire UEFA Champions League in the knockout round should be predicted. The players can also submit or adjust their bets until shortly before the start of the respective match day. Anyone who has already participated in the previous betting games for the 2017 Champions League finals and the 2018 World Cup can, by the way, register with their previous access data and simply participate again. So now quickly visit champion.dt-spareparts.com, sign up, submit your bets and with a little luck spend a great football weekend. DT Spare Parts wishes you lots of fun, luck and success!